If you missed Dr. Mary Beth Tung’s presentation yesterday at MACo Con 2017, you can see it now online. Good afternoon. According to the 2017 U.S. Energy and Employment Report (USEER), 6.4 Million Americans work in the Energy Industry. There has been a 5% increase in jobs within energy sector in 2016. The number of new energy jobs created in 2016 was 300,000. 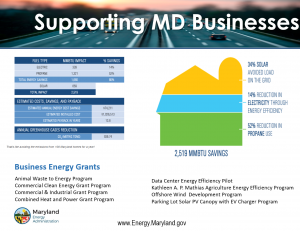 Based on Governor Hogan’s Green House Gas Reeducation Act of 2016, to reduce GHGs by 40% by 2030, Maryland is poised to increase clean energy and employment opportunities statewide via industry partnerships. Secretary Shultz will address this in more detail. However, one of the key drivers in job, business and economy growth that we want to imbue on this audience lies within energy efficiency. Energy efficiency enables businesses, and local governments to realize lost capital. Governor Hogan’s Green House Gas Reeducation Act of 2016 calls the State to reduce GHGs by 40% by 2030. Although renewable energy is increasingly popular, we cannot highlight enough how much of an impact your county can make to your budget and your community with energy efficiency upgrades. We will talk in a bit about the renewable jobs associated with offshore wind and two State grants designed to spur growth. Energy efficiency is a key component to reaching this milestone. Energy efficiency means using less energy to provide the same service. For example, a compact fluorescent bulb is more efficient than a traditional incandescent bulb as it uses much less energy to produce the same amount of light. 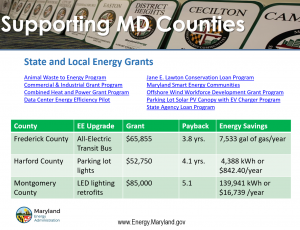 Grants to help upgrade your country’s lighting is just one of the many grants that the Maryland Energy Administration offers. The State can help you turn your business or municipal holdings into ATMs. 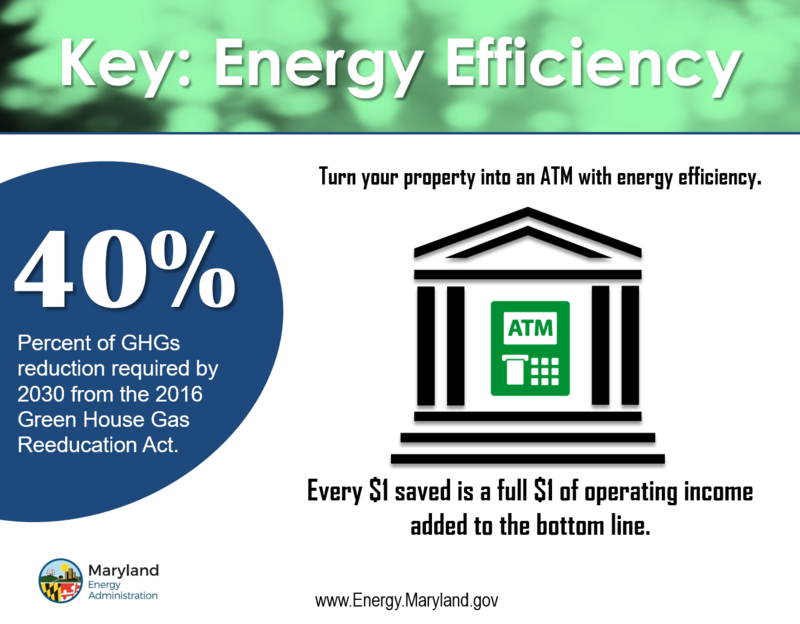 Remember this today, for every one dollar saved via energy efficiency in your property, is one full dollar of operating income that is added to your bottom line. Energy expenses are the most volatile for any county to manage and yet still they are the most controllable. Once your county funds are spent for the year they are gone. If you choose to invest in energy efficiency upgrades, you will have more money to spend in your budget over many years to come. 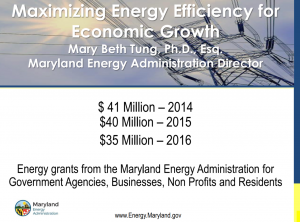 Let’s dive into the grants that the Maryland Energy Administration offers to help those of you in the county offices and your local businesses. 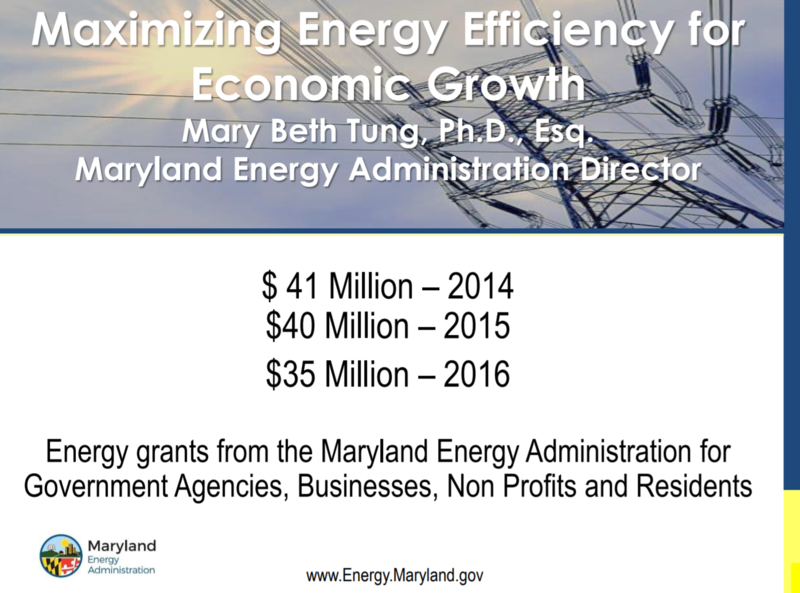 Frederick County is Maryland Smart Energy Community and has received $1.5 Million over past four years. Frederick County will use their FY17 grant of $65,855 to off-set the purchase price of an all-electric transit bus and a lighting upgrades. Previously, the Maryland Energy Administration helped to fund all-electric transit buses for the county with MSEC funds in FY14, FY15, and FY16. The expected payback for this investment in clean transportation is 3.8 years and the expected energy savings is approximately 7,533 gasoline gallon equivalent/year per bus. Harford County will use their 2017 award to perform lighting retrofits at the Joppa Library and Sodrun Waste Water Treatment Plant (WWTP). The Joppa Library project will replace 6 existing 400-watt metal halide High Pressure Sodium parking lot lights with 94 watt LEDs. This project is expected to save 4,388 kWh annually and $842.40/year with a simple payback of 4.1 years. The Sodrun WWTP received MSEC grants for FY15 & 16 as well and the total energy saved is estimated to be 70,293 kWh annually or $11,160.38/year with a simple payback of 4.41 years for the entire lighting upgrade. Montgomery County will use their 2017 award to defray the cost an LED lighting retrofits for their Facility Maintenance Department. The total project cost is $104,760. 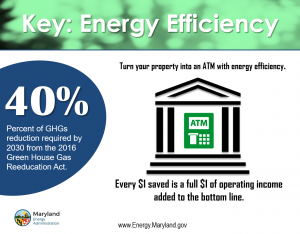 The expected energy savings is 139,941 kWh annually, saving about $16,739 annually for a simple payback of 5.1 years on this State award. 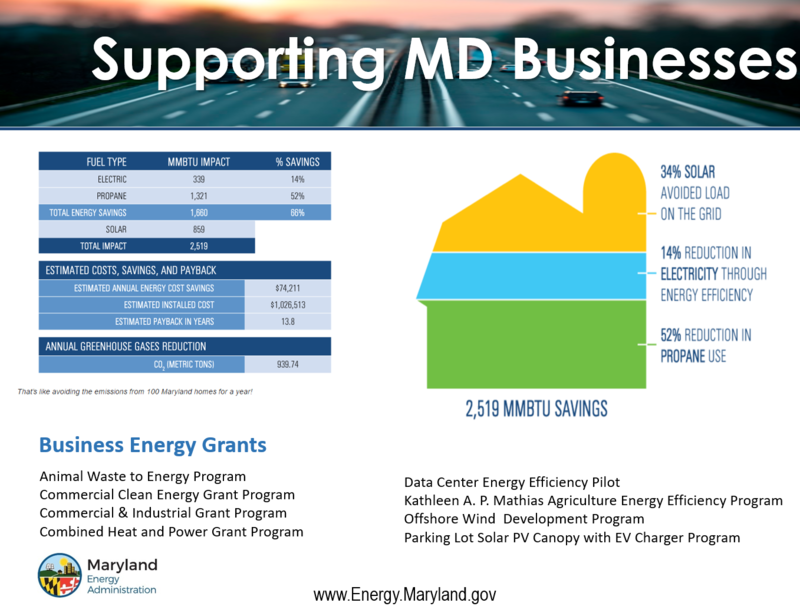 Our business energy efficiency grants spur savings that allow Maryland businesses to expand and increase their workforce. I recently visited one of our Data Center Energy Efficiency Pilot grantees who via the State’s grant was able to save 50% on their energy costs and realize a potential new revenue stream as a result of their energy efficiency upgrades. 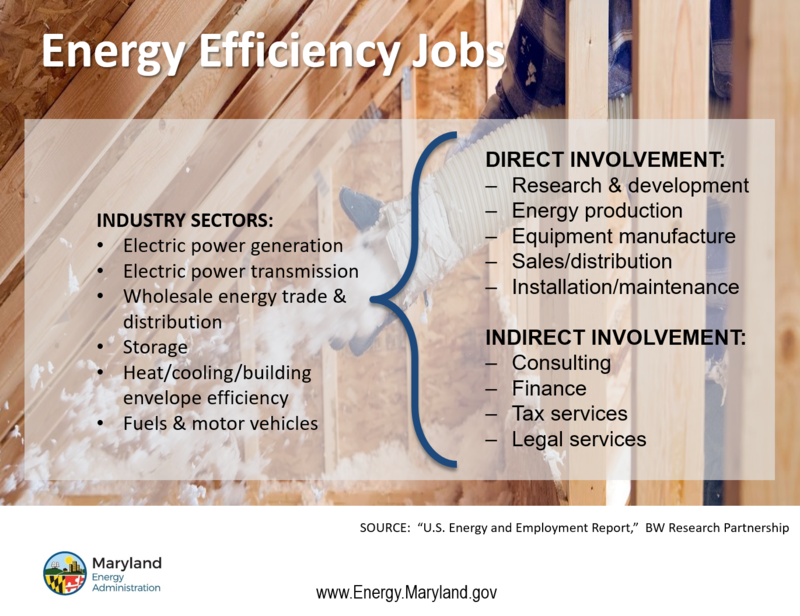 Now let’s address what energy efficiency jobs look like in Maryland. 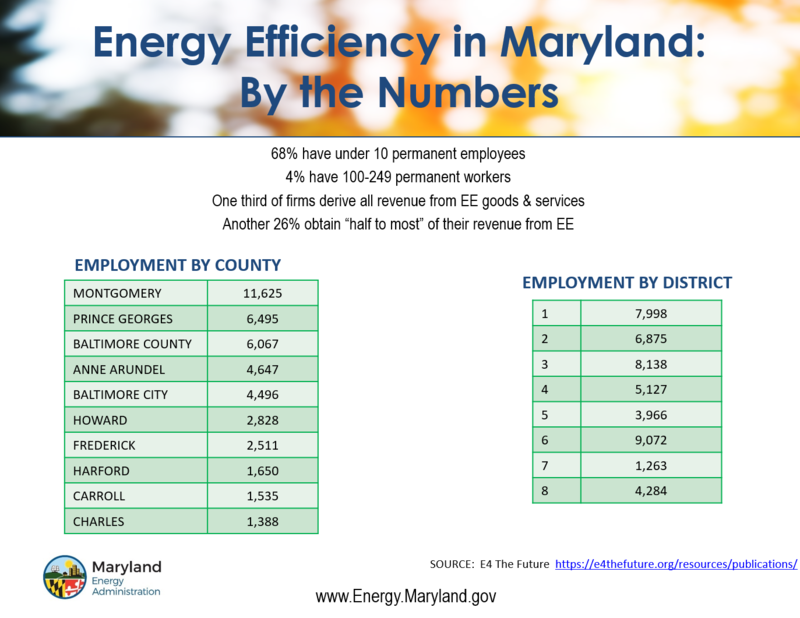 We will also give you a snapshot of the counties with highest number of people employed in the energy efficiency industry. 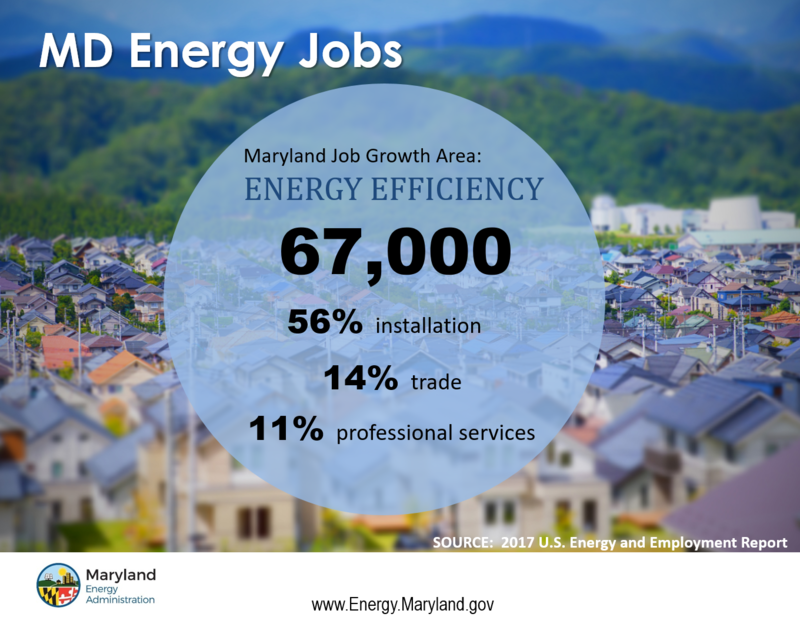 In state, we have over 67,000 individuals employed in the energy efficiency field however; this segment would steadily increase as more residents, business and organizations see the value in energy efficiency. Number of Marylanders employed in the energy efficiency sector. 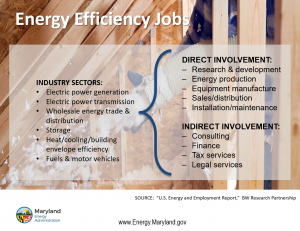 The U.S. Bureau of Labor Statistics includes energy efficiency jobs within their “green” jobs category jobs in which workers’ duties involve making their establishment’s production processes more environmentally friendly or use fewer natural resources. In Maryland, over 60% of our energy efficiency professionals work within HVAC, both traditional and high energy efficiency (Traditional HVAC, 55.9% + High Eff HVAC, 8.0%). 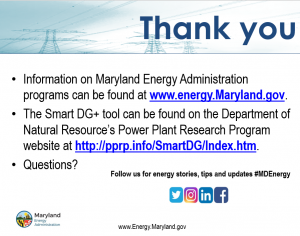 The Maryland Energy Administration offers to offshore wind specific grants, the Offshore Wind Business Development Grant and the Offshore Wind Workforce Development Grant. 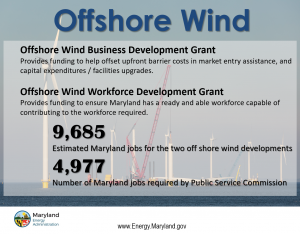 Maryland Energy Administration seeks to jumpstart Maryland’s offshore wind supply chain and help ensure we have the pool of trained professionals in the State to serve this industry. These jobs will range from construction to operations and maintenance. However, these the forecast for offshore wind jobs goes far beyond these two projects. 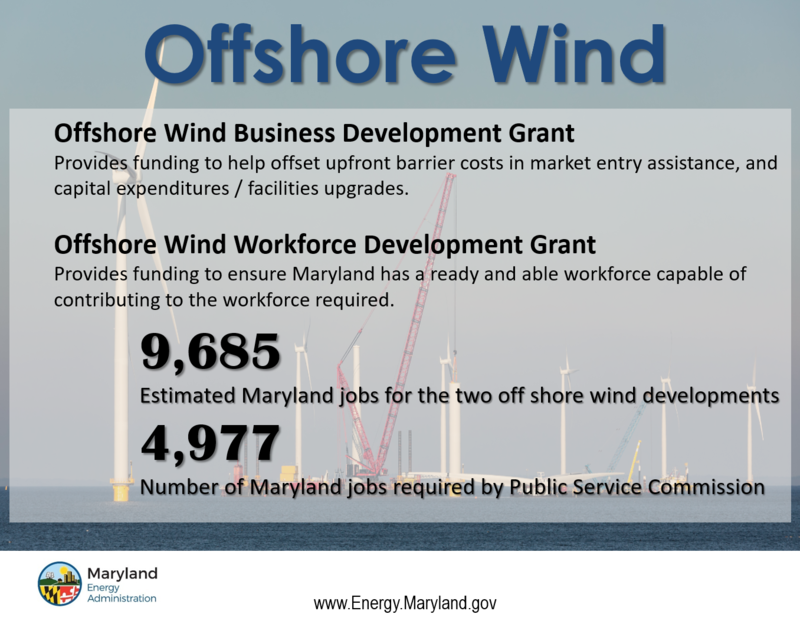 Maryland is poised to become the Silicon Valley for offshore wind by developing a central supply hub to service the expanding U.S. offshore wind market. While MEA has programs for residential renewables, there are also initiatives aimed at larger scale renewable deployments. 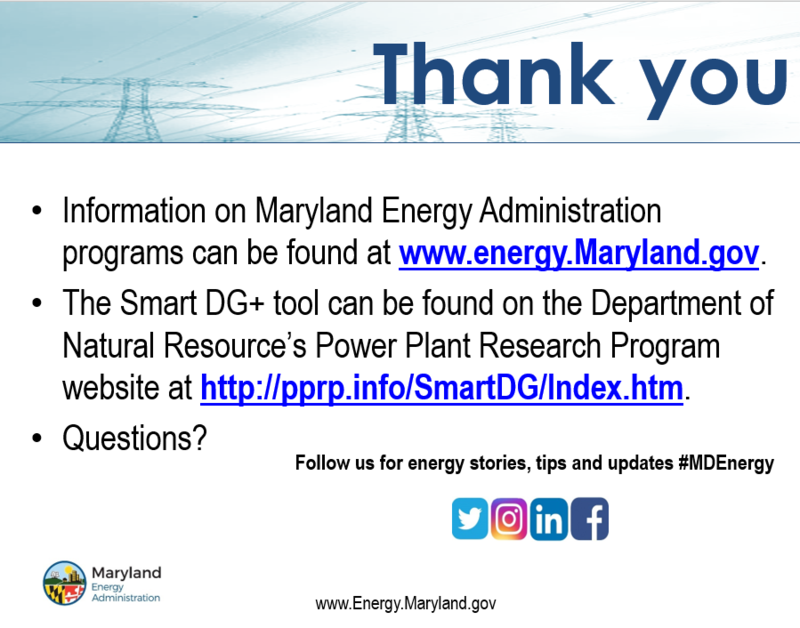 The Smart DG+ tool is a tool developed by the Department of Natural Resources with funding and input from the Maryland Energy Administration. The tool is geared towards projects 1- 10 MW in size and is focused at helping potential developers to identify areas that would be suitable for renewable energy generation, such as solar, as well as areas that may have barriers to construction. 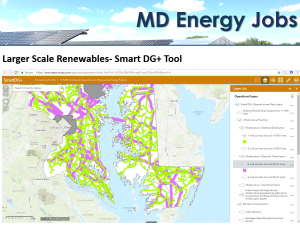 With this tool, the goal would be to ensure that developers interested in investing in renewable projects in MD communities have the tools they need to make decisions that reflect the best interest of both the local communities and the developer. 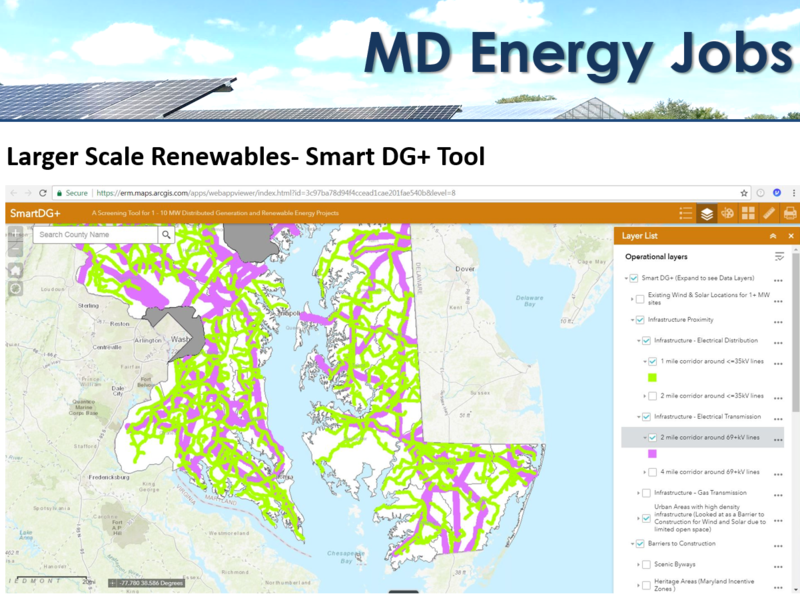 As a side benefit, this tool could also be a helpful tool for local communities as they consider renewable energy projects. Here is an example. Since we are in Ocean City, we’ve chosen to focus in on this portion of the State. 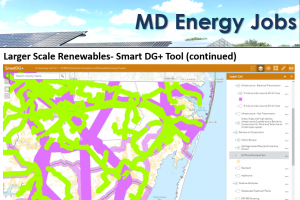 In this map, we’ve selected the map layers that show where the electrical transmission (green) and the electrical distribution (purple) lines are in the State. These factors would be considered positive attributes to someone siting a project that generates electricity. Now here is another example where we’ve layered in some site attributes that may make a site less attractive to development. 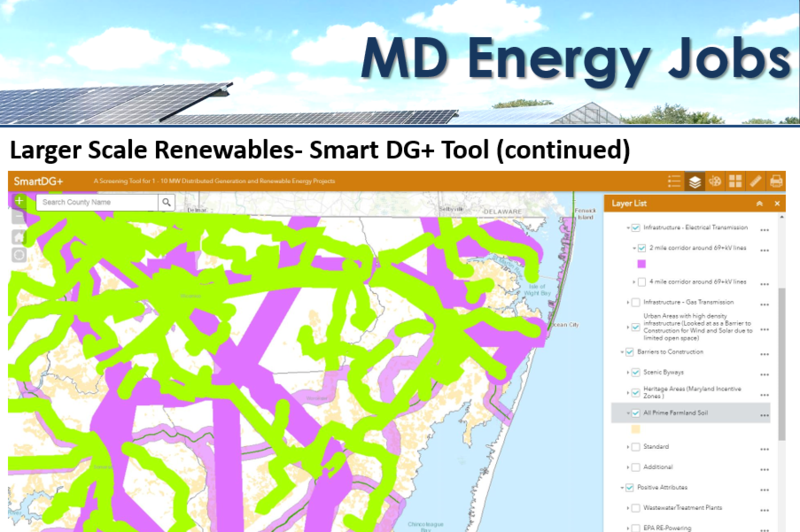 We’ve zoomed closer to Ocean City and have added in map layers that show where scenic byways (dark green line), Heritage Areas (lighter purple), and prime farmland soil (peach) are located as these sites may be more difficult or impossible to develop. There are many layers beyond the ones highlighted here today. This tool is posted on the DNR PPRP website and will soon be posted on MEA’s website as well.